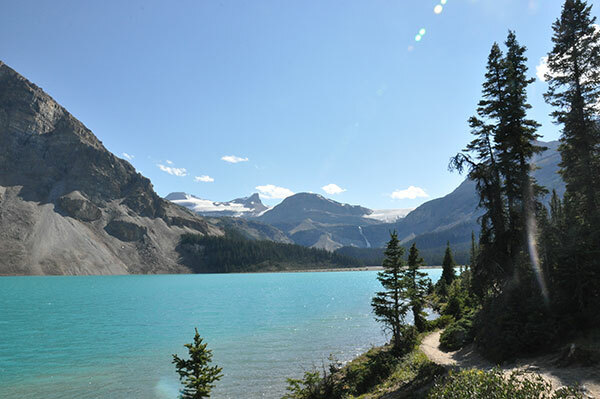 Looking back on our Lake Louise hiking photos albums, this trail is one of my favorite Lake Louise hiking trails. 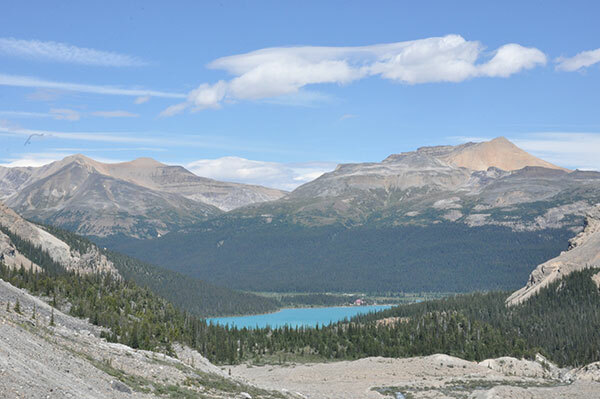 Trailhead: Highway 93 North (Icefields Parkway), 36 km north of the Lake Louise junction, 400 m down the Num-Ti-Jah Lodge access road. The trail is 4.6 km one way and 155 meters elevation gain. Around 3 hours round trip. If you are looking for a great walk workout with constant beautiful view, this is the trail for you! 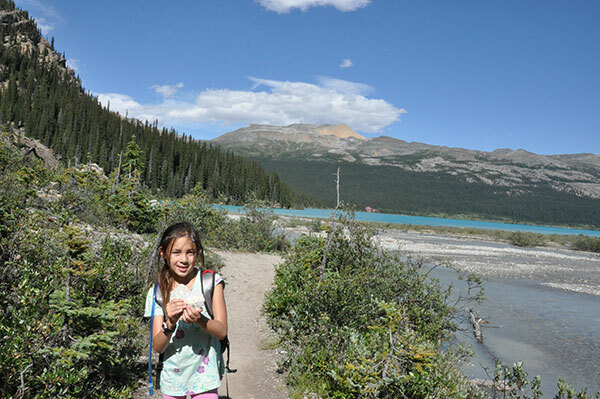 This is a very nice hike which combines a great combination of hiking along a milky-blue lake, going through the fragrant woods, hiking along a river wash, and scrambling over some rocks to the fall. 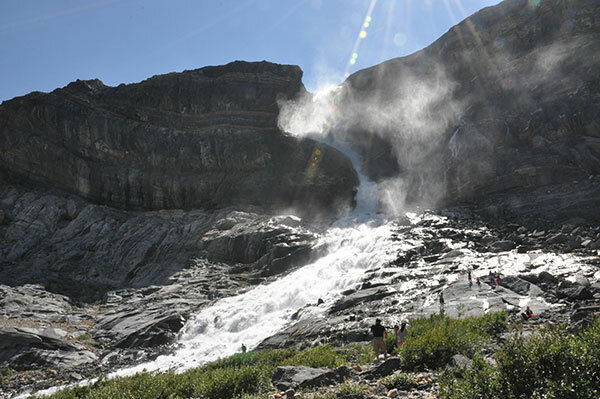 When Best Time to Hike Bow Glacier Falls? 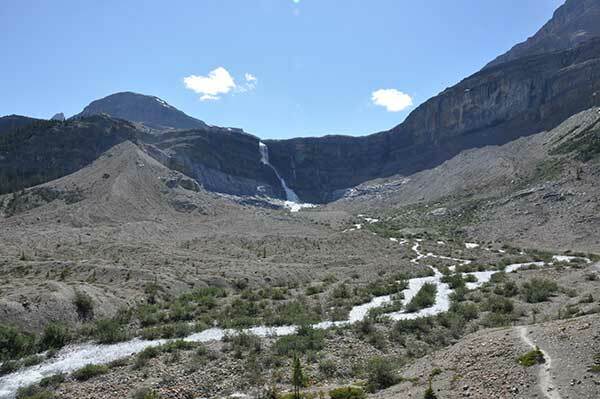 I think the best time to hike the Glacier Falls is later spring from Later May to early of July, when flowers are booming and glaciers started melt down to falls. 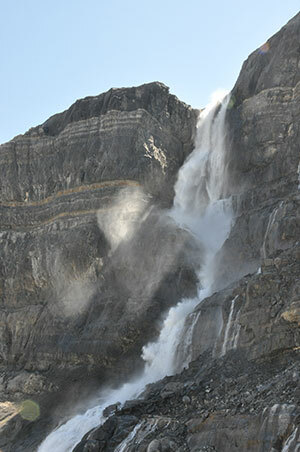 Also you will see the pouring water falls. When you stand by the fall. You felt thousands exciting horses running pass by you. 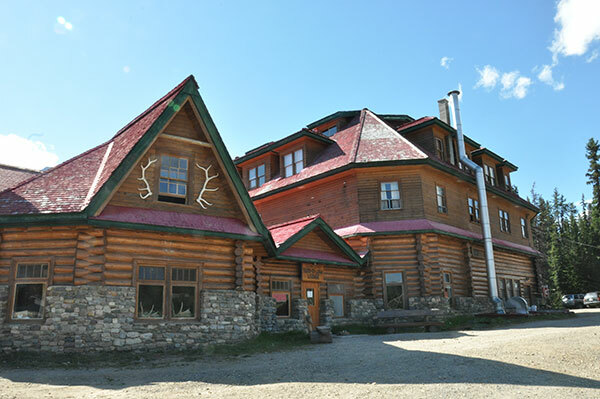 The trail starts behind of historic Num-Ti-Jah Lodge. 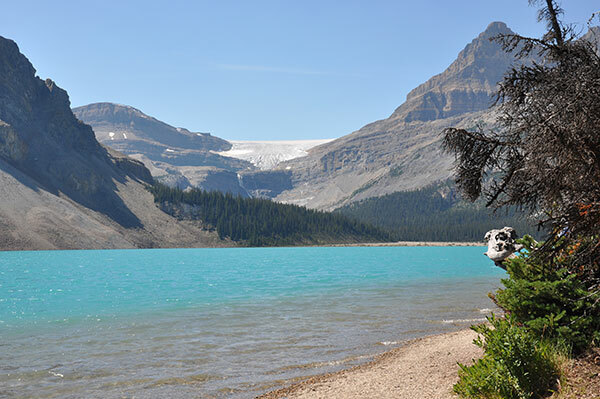 We took a short detour from the lodge parking area to the shore for breathtaking views of mountain-surrounded Bow Lake and the magnificent Bow Glacier. 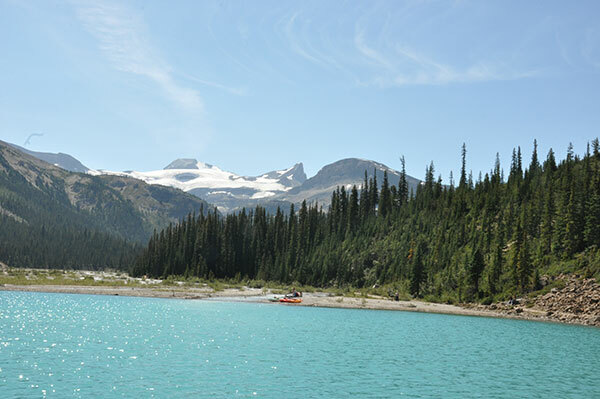 The water is an amazing crystal blue/green and the mountains are picture perfect backdrop. Bring your camera! 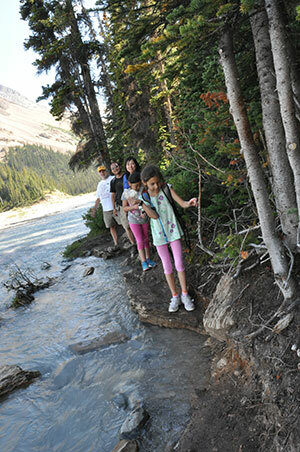 Bow Glacier Falls Trail is accessed from the shore of Bow Lake via a wooden bridge over running water. 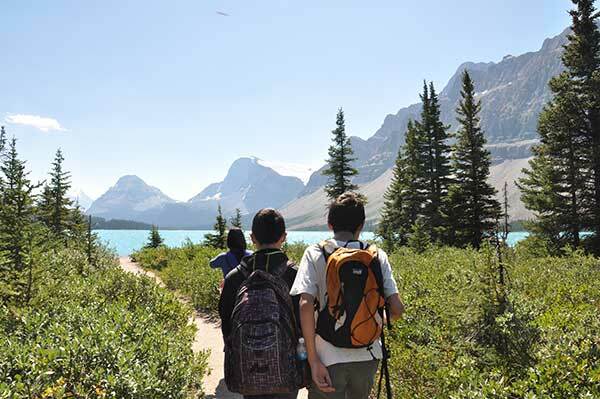 The first 3 km easy part of trail is along the shore of majestic Bow Lake surrounded with majestic Rockies, and then the short stretch of the Bow River from the glacier to the lake. 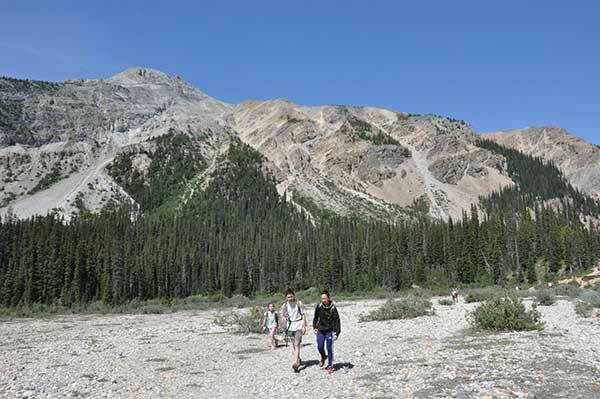 The last 1.6 km trail is the most difficult portion where most of the elevation gain is found. The trail then led us above a gorge and onto an area where we could see the falls a short distance away. 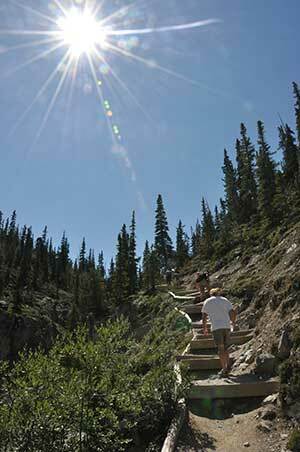 We were lucky – the day we hiked was sunning day. 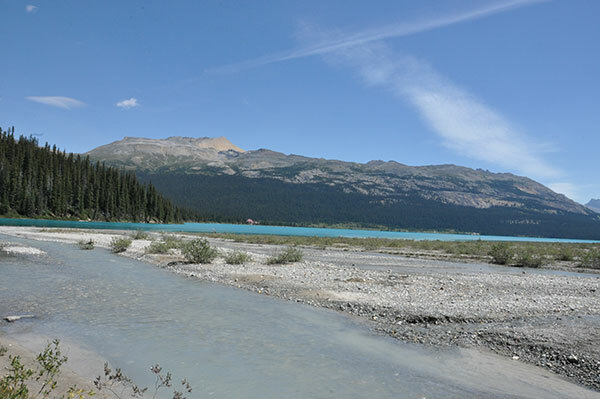 The water is very clear and calm, and showing different shades of blue from different angles. Blue water, blue skies, green trees. WOW! 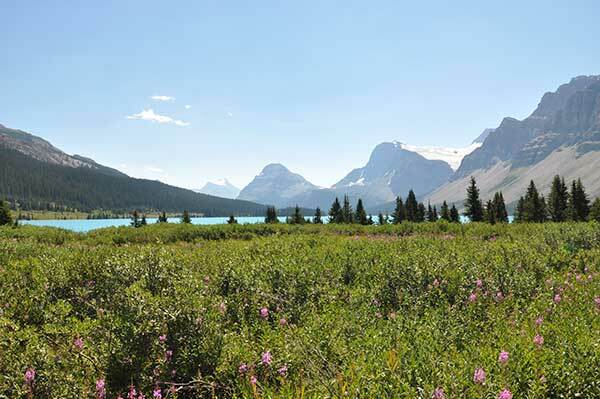 The Bow Lake is the source of the mighty Bow River which runs through the City of Calgary. 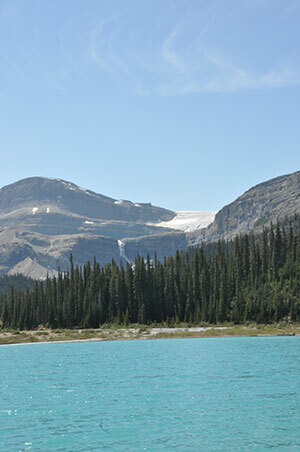 The Glacier is visible from the hiking trail on the shoreline of lake. 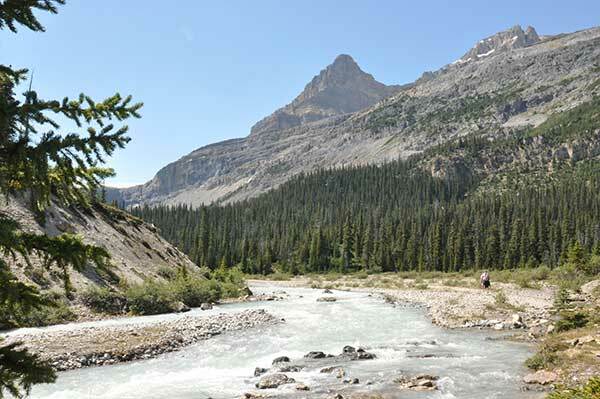 At the end of lake, you can see a stream of Bow river from Glacier Falls feeding into the Bow Lake. 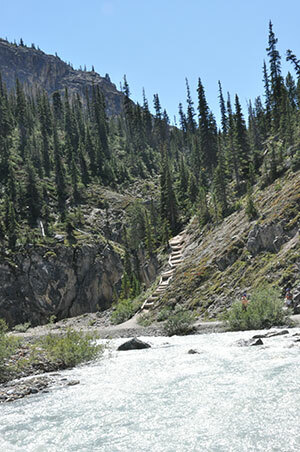 Before climbing up the big steps, we can continue walking left a short distance for the view of roaring white water cascading through a narrow canyon. The giant steps leads us above a gorge. 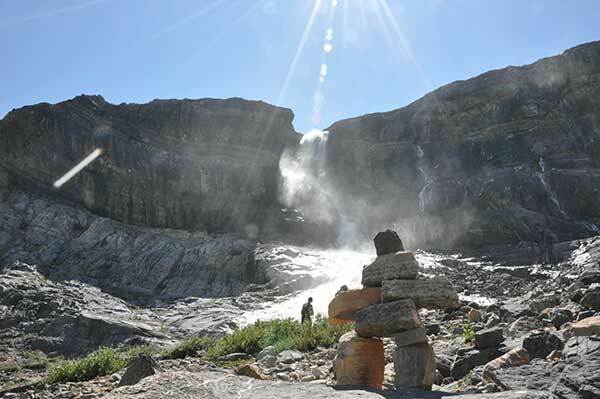 The trail split in two at half way of steps – left to Bow Hut, right to the Falls. Of course, we stayed to right. Short after giant steps, we were onto a summit area where we could see the falls a short distance away. 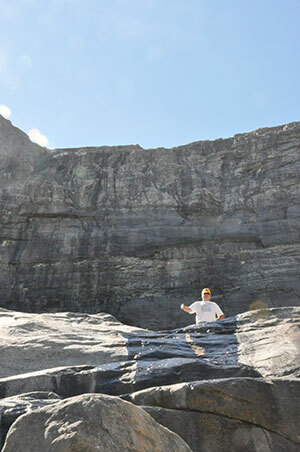 The photos above was taken on the summit area. 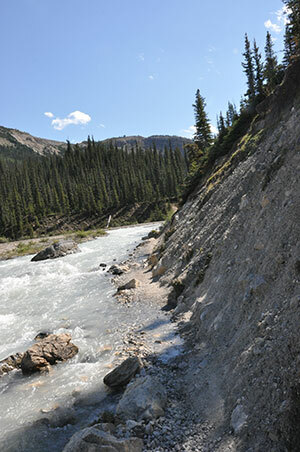 From here, all loose stones along the path to the Falls, so lookout for good foot placements. We passed an Inuksuk while we were reaching the falls. Once we reached the falls, we found a nice giant rock to relax and have lunch. It is a wonderful spot for picnic and photos. After lunch, some of us kept towards the bottom of falls. 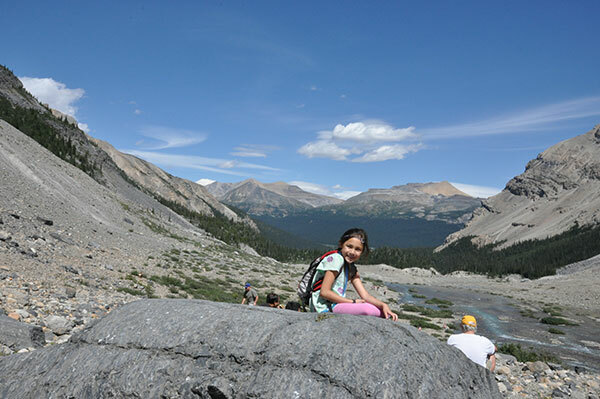 Rest of us kept climbing up as far as we thought safe with awesome views of the glacier valley below. 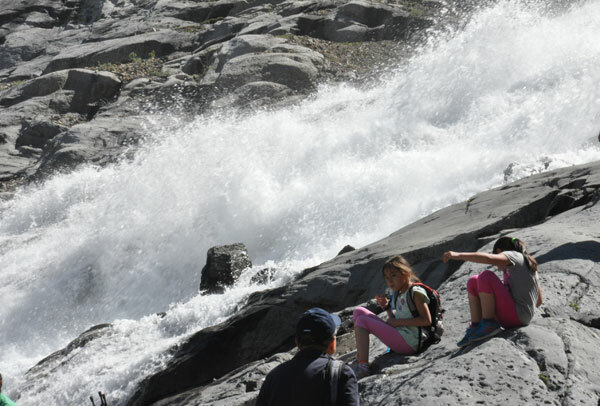 At the base of the Glaciers Falls, can you image how you feel when you sit on a rock and close eye, listening the roaring sound, and feeling the cool mist touching your face in hot sunny day. While heading back, the experience is different - the trail has couple places were washed off on the way back. 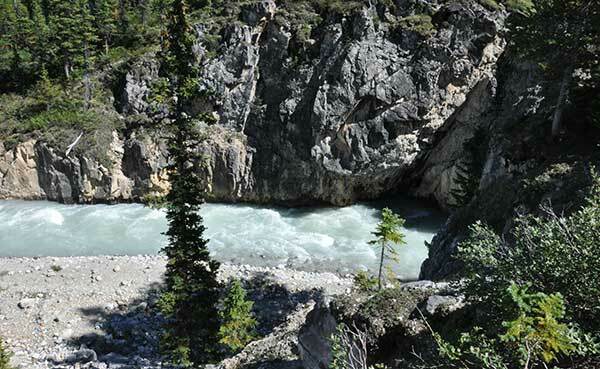 The possible reason is that it is hotter afternoon than morning, and glaciers are melting faster so that the water level getting higher. We tried to scramble around or over the wash out path. If you bring small kids who most likely love to step into water, and got those socks wet as well! So bring extra pairs of thick socks for the kids! Thick socks are good as they keep their feet warm and slows the wetness seeping to the foot. 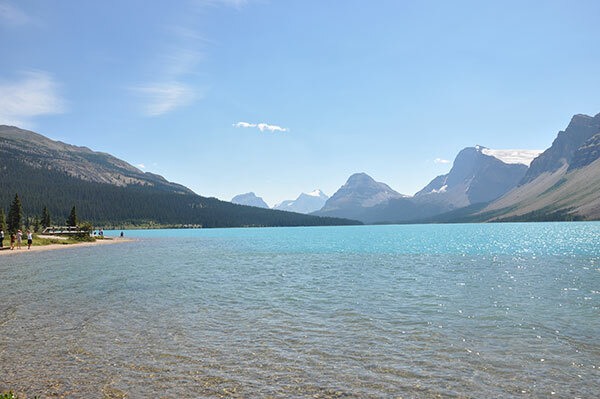 When we return back to Bow Lake, we took a break at the beach. You know most kids love to threw stones at beach. 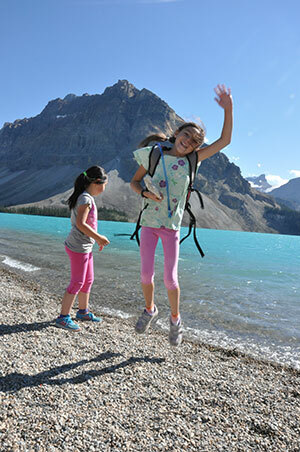 Kids are still full of energy to jump after hiking. It is also nice to stop at the snack shop in Num-Ti-Jah Lodge for snacks and drinks after the hike. 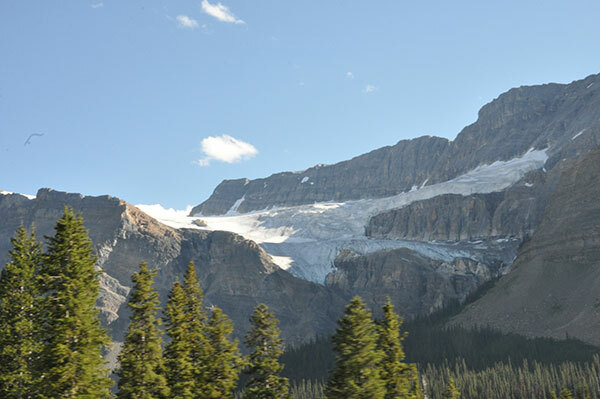 The Crowfoot Glacier photo above was taken right after leaving Bow Lake towards back to Lake Louise. Be prepared with good quality hiking shoes. 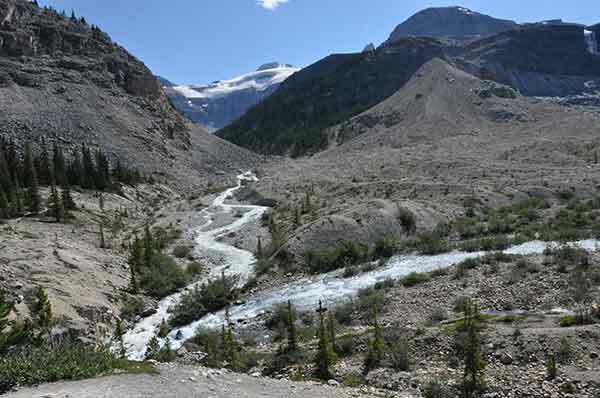 Some parts of trail, particularly over alluvial plains and the final approach to Bow Glacier Falls are full of uneven rocky surfaces. There were people on the trail in running shoes and sandals who may not make it all the way. If you have kids, bring extra socks for them. 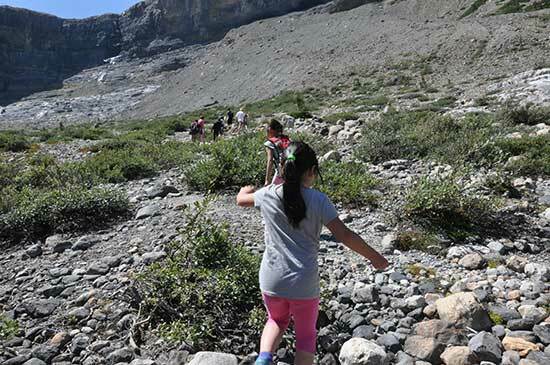 If you love outdoors, you will enjoy Bow Glacier Falls hiking for sure. Don't miss it! 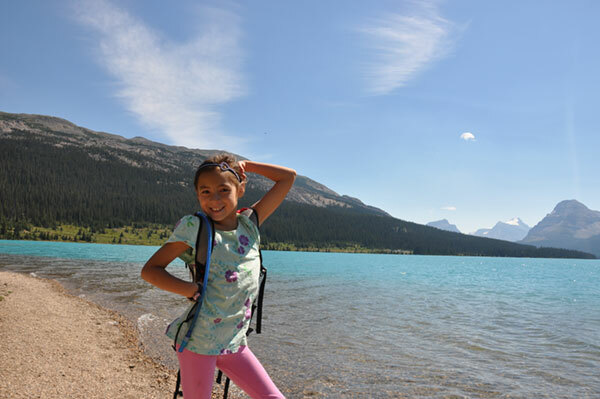 What is your special magic moment in Banff captured through Banff photo? 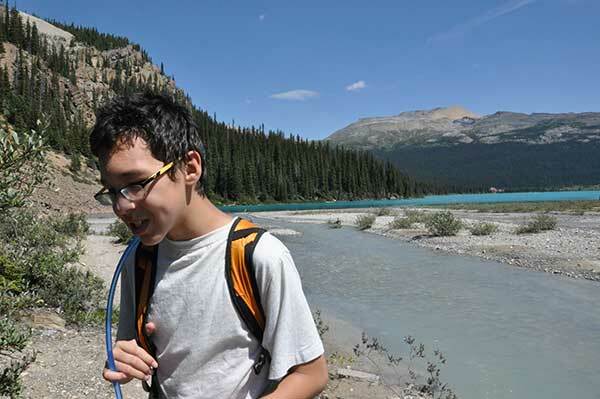 Click here to share your stories and Banff pictures.